I saw this guy for the first time in a TV serial at doordarshan, its called "Oru Manidhanin Kadhai" where he would have acted as a drunkard, my god, what an unbelievable acting, really he made lot of people to avoid drinking after seeing that serial, thats the impact of his acting. As everyone knows his famous dialogue being "I know, I know, I know" from the movie "Puriyaadha Pudhir", he would have portraited the role of an obnoxious husband, i would rather say that he lived that role. 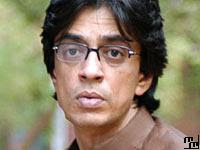 There was a time where all leading heros refused to act with Raghuvaran (if he is the villan) just for the fact that he steals the show from the rest of the crew and he get laurels for his acting skills, the public conveniently forgets the acting of the hero and praises Raghuvaran, and infact thats one reason for he not acting in many films, when such crooked people are reigning this tamil film industry, we can never discover such great talent. I recently saw him at the chennai airport, and had a chance to talk to him, i just wished him a "Hi" and told him that he has done exceptionally well in the movie "Shivaji" though it was just a short stint. Its a great shock to me to see that he is no more with us. I sincerely pray to GOD for his soul to rest in peace. I am sure this his absence has certainly created a void in the film fraternity and its not that easy to fill that. Would you please tell me how he looked like when you met him? And how he responded? I am a huge fan of him.